Many of you know from my Instagram feed that I mill a lot of whole grains in my kitchen. The reason is plain and simple: freshly milled flour brings rich dimension to baked goods, adding layers of texture and intoxicating aroma. Recently, as I was milling whole oat berries, properly known as groats, I had a flashback of sorts: I remembered an invigorating breakfast I used to enjoy in Germany years ago. It is made with fresh oats. Yes, real fresh oats. But aren’t all oats fresh you might ask? Kind of: store-bought rolled oats or steel-cut oats have typically been steamed or toasted to prolong shelf life because oats contain a large amount of good healthy fat and thus can spoil over time. By fresh oats I mean whole oat kernels from a farmer’s field similar to other grains you might buy such as whole wheat berries, with only their inedible outer hull removed. It is the good fat and the natural sweetness of oats that is behind the deliciousness of this revitalizing breakfast. Compare them side-by-side with store-bought rolled oats and you will be blown away by the difference. Fresh oats have a rich vibrancy that is unsurpassed, and I invite you to try them. Coarsely milling fresh oats also gives you a textural range that I love: you will have some nubby pieces to chew on in your bowl but also finer granules which become soft and comforting during a period of soaking. You can also use a grain flaker to enjoy a similar delectable breakfast by freshly flaking whole oats, similar to rolled oats (for sources, see below). No worries though, I haven’t turned into a raw diet adherent—I simply remembered the superb taste of this nourishing breakfast. For it, I coarsely mill the whole oats and give them an hour-long or overnight soak in boiling water. In Germany, some recipes call for soaking the grains in cold tap or filtered water overnight. I’ve tested both for this recipe. I find boiling water gives the breakfast a familiar comfort feel, so I share it here given that we are still in the thick of winter. In summer, I can see cold-soaking the grains to be a winner. You will need a little less water then, adding just as much as the grains can absorb. Either way, store the oats in the fridge during soaking. Cold-soak on the left, hot soak on the right. After the soak, just stir through some whole-milk yogurt and top your bowl with fresh fruit, and more yogurt. Any cultured dairy works well here but also a bit of cream or any alternative milk such as almond or coconut. Last but not least, I sometimes coarsely grind pink peppercorn on top—the stunning seeds, which are not part of the pepper but the cashew family, have a floral fruitiness to kick up your breakfast. Enjoy, and let me know if you give them a try. I chose to keep this porridge super-simple to let the aroma of the grains shine. My last bowl tasted like marzipan (!)—yes. This is the aroma of the whole oats I just picked up in my new grain share from Pioneer Valley Heritage Grains CSA—for more, see my Instagram post from last weekend. 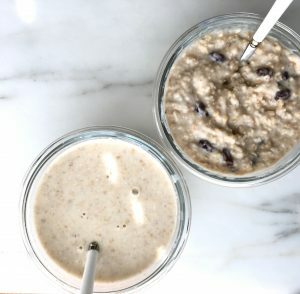 1 At least 1 hour ahead or overnight: add the oats and the raisins to a medium bowl or lidded 2-quart container, preferably glass. Gradually stir in the boiling water, using a spoon, until combined. Allow to sit at room temperature for 1 hour, or cover and chill overnight (and up to 48 hours). Remove the oats about half an hour earlier to take the chill out. 2 When ready to serve, remove the oats from the fridge about 15 minutes earlier to take the chill out. Stir through 3/4 cup of the yogurt. 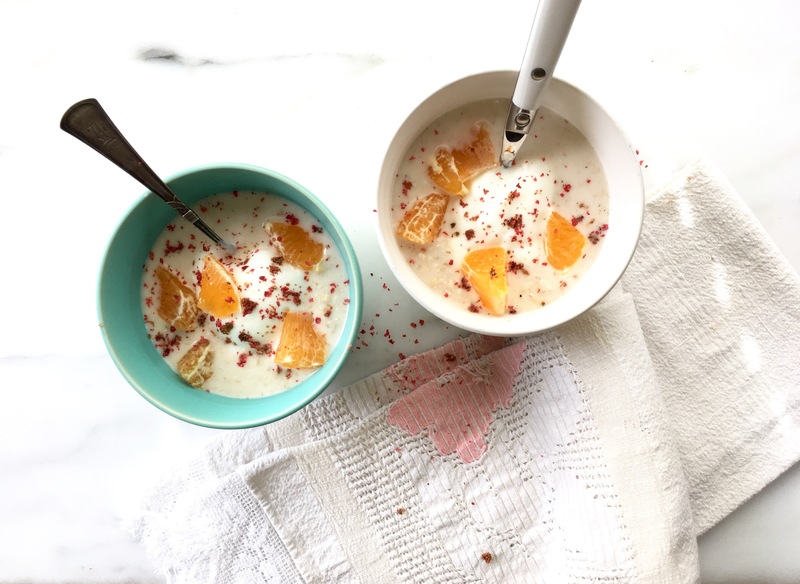 Distribute the oats between 4 serving bowls and top each serving with some of the remaining yogurt and some of the fruit. Garnish with pink peppercorn if you like. How to mill or flake oats? (*) You can coarsely grind oats in a grain mill (I use the 7 setting of my tabletop Hawos mill) or flatten them in a grain flaker. The latter is sold by my friends at Hayden Flour Mills who also carry Heritage Oats that I have yet to try, and at Breadtopia, an excellent resource for bread bakers, and at Pleasant Hill Grain. The latter two online shops also carry tabletop mills similar to my Hawos workhorse, and the Mockmill attachment for the KitchenAid stand mixer which is an excellent affordable option for the occasional home-miller. Or simply toss 1/4 cup whole oats, one serving, into a spice grinder and pulse about 4 (1-second pulses), stopping and shaking the grinder once in between until you have a mixture of coarse nubs and floury chunks. (**) Please note the amount of liquid depends on the coarseness and type of your oats so use the amount above as guidance and make adjustments as needed. Your grain mill can clog up when grinding oats because of their high natural oil content. If this happens, there is an easy fix: Just move the knob or lever to a coarser setting until the mill runs again. After the funnel has been cleared, be sure to mill enough hard grains such as hard wheat berries to thoroughly clean the stones. Fresh Whole Grain Bread — Everyday! Complete the form below to receive an email whenever new posts are created.